I actually lived in a spot of riparian forest when I was a teenager and had to walk two miles through a road before I found the first bakery when reaching the city limits. The first half of the way I walked bordering the river’s gallery forest; in the second half, I had to circle a small farm’s fence formed by a living wall of Eucalyptus and dearly remember its leaves’ and fruits’ scent in the heat, in the cold and in the rain, fresh, green, dry and even rotten. The traditional camphoraceous bite is certainly here but accompanied by a warm touch that I only felt in the Summer, when the green broken leaves blended with sun-bathed fruits on the ground. It is sweeter and rounder than the actual thing and even more persistent: I used to rub a few leaves in my hands when going back home from school at lunchtime and would smell traces of it until early night, but a diluted drop of this material will scent a room, even if faintly, for a good four days. This is sticky even when diluted up to the 25% mark, so I recommend going as far as 10%. 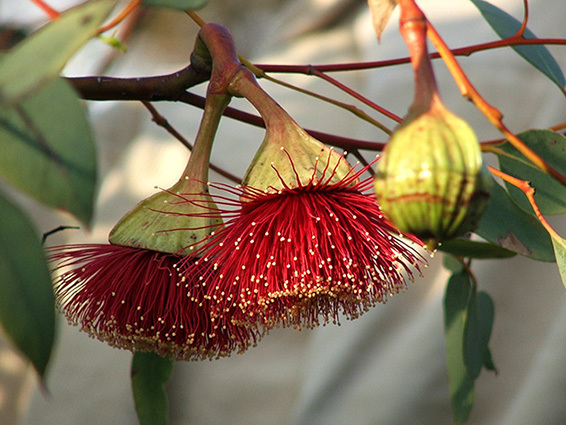 Since Eucalyptus has been used for decades as a functional scent, for cleaning and health products, most may feel this is a vulgar material, but I invite everyone to try blending it with the likes of Juniper Berries, Blackcurrant, Strawberry, Apricot, Spruces and, surprise!, Nutmeg, Coffee, Beeswax and Bitter Almonds for impressive results.